There are 3 versions to the review. All of the problems are the same, but the values are different in each problem. The students can help each other with the process, but cannot copy. 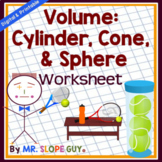 This test covers the volume of cones, cylinders and spheres. 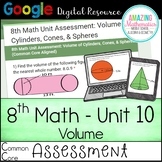 It can be edited to be used as a review worksheet as well. There are 2 word problems. Student fill in the blank notes that go along with the PP. 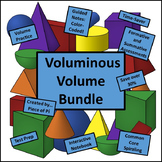 Volume aligned with the TEKS (8.7A)Completely editablePlease leave feedback!! 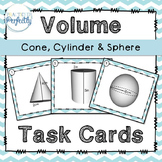 This fun, hands on task uses sweet treats to apply volume of cones, cylinders, and spheres. *Answers based on the product you use. 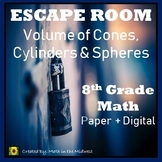 Student will solve problems to find the volume of cone, cylinder, sphere. Diameter and radius are given. Key is here. 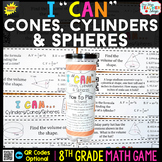 Students strive to get BINGO as they find the volume of cones, cylinders, and spheres! 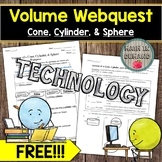 Volume of a Cone, Cylinder, and Sphere Webquest (3-Dimensional Objects) FREE!!! 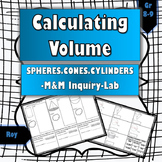 Learning Volume Calculations (Cone, Cylinder, Sphere) with M&Ms!